Is mineral make-up a new trend? Not exactly. It’s been around since the 70s and then was popularized when brands took notice that there was an interest in “natural”. 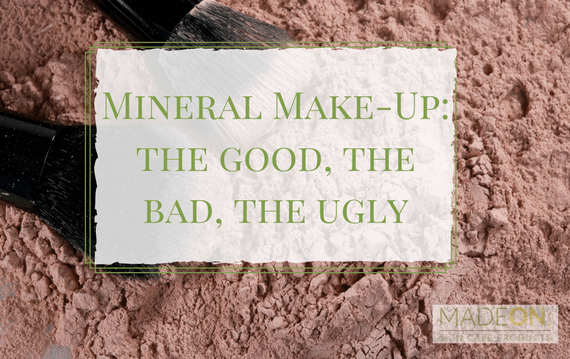 What exactly defines mineral make-up? In a nutshell, mineral make-up is made up of mineral ingredients, like zinc oxide, iron oxide, titanium dioxide, and mica. While it’s nice to think that these ingredients were taken directly from the earth and produced into make-up, the reality is that these ingredients are still extracted and processed in a lab. And you really don’t want it any other way, or you may end up with impurities like lead or mercury in your make-up. Why the backlash against traditional make-up? There are two main reasons: 1.) some ingredients are identified as toxic or cancer-causing, and 2.) the preservatives, fragrances and/or emulsifiers used as ingredients can irritate the skin and cause eczema, dryness or rash. Are all the ingredients of mineral make-up pronounceable, common, and even edible (or, should they be)? No, don’t assume this. In fact, unless you make it yourself, you’d need to make sure the company uses preservatives if water is part of the recipe. Microbes thrive in water, so without a preservative your mineral make-up might leave you with an infection. What about FD&C Blue or D&C Lake pigments? The Environmental Working Group rates these as a very low hazard. They do get a bad rap in foods, but they’ve been Generally Recognized As Safe (GRAS) by the FDA. Lake colors can be derived from coal tar and can aggravate the skin. Preservatives, good or bad? It depends. I checked out Cowgirl Dirt’s preservatives (not all, but most) against the Environmental Working Group’s database and they rated between a 1 and 4 (10 is the worst). Previous post What’s in Mineral Make-Up? Next post What Causes Chapped Lips?